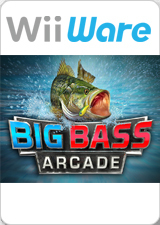 Big Bass Arcade is stocked with features: 4 fish filled lakes, 9 lures, and 5 multiple lake tournaments. High scores are tracked for every event on your quest for the World Record Bass. Experience life-like fish behaviors and spectacular visual effects. The graph below charts the compatibility with Big Bass Arcade since Dolphin's 2.0 release, listing revisions only where a compatibility change occurred. This page was last edited on 7 September 2017, at 09:05.